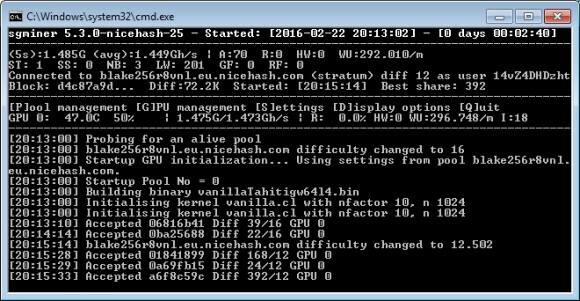 We have not posted new releases of sgminer binaries for Windows for quite some time as there was nothing that much happening on the AMD GPU mining scene as compared to the development for the Nvidia GPU miners with ccMiner. But it is time for an update with the sgminer 5.3.0 the nicehash fork (source code), because the official development of sgminer on GitHub isn’t going anywhere for quite some time. The sgminer 5.3.0 nicehash adds an improved NeoScrypt kernel as well as support for the new Blake256 8 and 14 round algorithms including Vanillacoin (VNL), though there is no support for Decred mining available in this release. The Windows binary available for download is a 32-bit one, so it should offer better compatibility on more mining systems running a Windows operating system.